Enter general notes here about professional activities. These notes may explain or elaborate upon the taxonomy terms listed in the fields for this block. Enter Academic Societies in which one maintained active participation, such as regular conference attendance, holding of an office, etc. Elaborate upon the nature of the participation in the Professional Activity Notes field. This is a taxonomy field. For a taxonomy field, enter a word or two, and then wait to see if the desired term appears as a possible selection. Try to avoid creating duplicate terms, if possible. If the desired term does not appear, then enter it in this field and it will be added to the taxonomy term list when you save the record. For regular conference participation, indicate the sponsoring society in the Societies field instead of using this field. This field lists specific, non-recurring conference events, which have special importance or were by invitation-only. 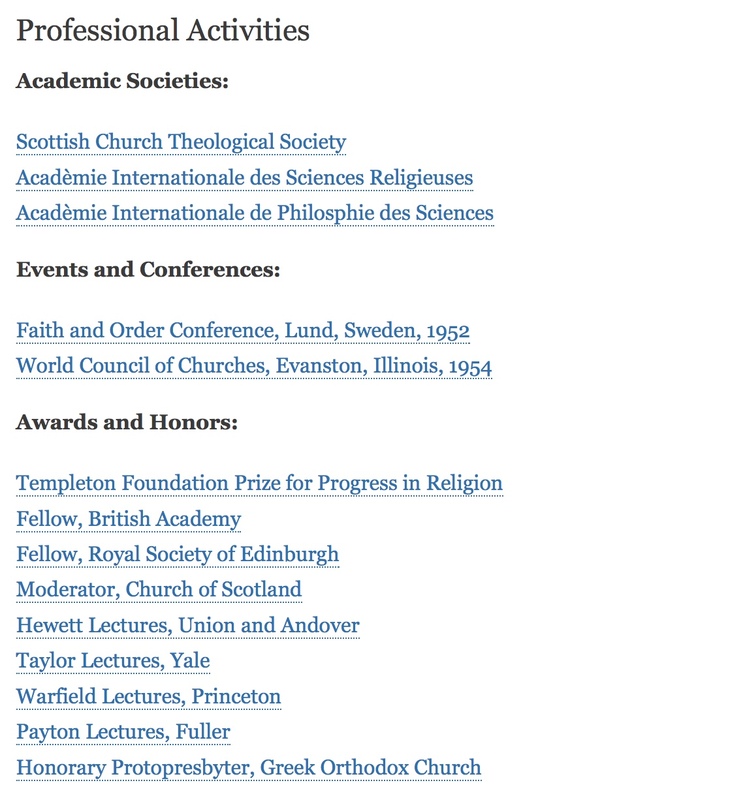 Enter conference name, year; such as: Conseil Solvay, 1911 (or) World Council of Churches, Evanston, Illinois, United States, 15–31 August, 1954. This is the "Events and Conferences" taxonomy field. For a taxonomy field, enter a word or two, and then wait to see if the desired term appears as a possible selection. Try to avoid creating duplicate terms, if possible. If the desired term does not appear, then enter it in this field and it will be added to the taxonomy term list when you save the record. Enter academic awards and honors, including book awards, distinguished lectures, society prizes, academic chairs, etc.